Home >> A Books >> Picture Books for Children of *Every* Color! 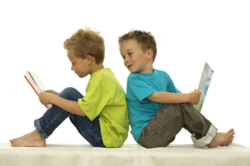 Picture Books for Children of Every Color! Celebrate Black History Month by adding two new picture books to your classroom library. Both are about African American children and for all children. Leola and the Honeybears (Cartwheel Books/Scholastic), by Melodye Benson Rosales, retells the classic fairytale "Goldilocks and the Three Bears" -- with a twist. This Goldilocks, whose name is actually Leola, doesn't have golden locks at all. She has honey-brown skin and mountains of black-brown curls. She also has, like all children -- including Goldilocks -- a disposition that ranges from "sweet as brown sugar" to "stubborn as Grandmama's mule." The stubborn part gets her into trouble. On the morning of our story, Leola, feeling bored and much too stubborn to listen to Grandmama, wanders into Pine Hollow Woods, where a family known as the Honeybears own a charming little inn. Papa Honeybear is a GREAT, BIG bear. Mama Honeybear is a MIDDLE-SIZED bear. Lil' Honeybear is LITTLE, just like his name. Of course, honeybears who own charming little inns don't eat porridge. They eat GREAT, BIG plum pies, and MIDDLE-SIZED rose petal cobblers, and LITTLE huckleberry tarts. They do, however, still sit in chairs of different sizes, sleep in beds of different sizes, and come home from walks to find sleeping little girls in their LITTLEST bed. Guess what happens next! Even without the anticipation of the unknown, this is a charming story for all children and a terrific addition to your school or classroom library. The text and illustrations vividly conjure up images of the rural South. You can almost smell Grandmama's freshly washed laundry flapping in the breeze! On the other hand, the ending is a little unbelievable. "From that day on -- even when she wanted to do what she wanted to -- Leola always listened to her Grandmama." Back Home, (Puffin Books) written by Gloria Jean Pinkney and illustrated by Jerry Pinkney, is the simple story of a young girl's journey to the place where she was born. Eight-year-old Ernestine has left her family "up North" and traveled by train to visit her Aunt Beula, Uncle June, and cousin Jack in Lumberton, North Carolina. Her short vacation on the family farm turns out to be a journey of kinship and discovery. Some of Ernestine's discoveries are simply fun -- if occasionally embarrassing. She names a kid and finds she's wrong about its gender. She rides -- and falls off -- a goat. She jumps into -- and gets stuck in -- an ocean of grain in the feed barn. She helps her aunt can peaches and her cousin feed biscuits to the goats. Other experiences, however, connect Ernestine to her family's history. She sees people, places, and things that, until now, have existed only in her mother's stories. She rides in the same pickup truck that her mother rode in as a schoolchild. She explores an old steamer trunk and leafs through a family scrapbook. She finds -- and wears -- an old pair of her mother's overalls. She visits her grandmother's grave. This is a story without mystery, suspense, or mayhem that will provide students with lots of ideas for discussion. It's also a perfect read for that unit on families you've been planning! All children are sure to find the words and rich watercolor illustrations in this warm family book both appealing and comforting. The books highlighted in this week's Education World BOOKS IN EDUCATION story are available in bookstores everywhere. If you are unable to locate a copy of the book you want, ask your bookseller to order it for you or contact the publisher directly. 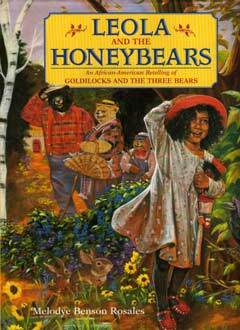 Leola and the Honeybears: An African-American Retelling of Goldilocks and the Three Bears, written and illustrated by Melodye Benson Rosales, is published by Cartwheel Books, a division of Scholastic Inc., 555 Broadway, New York, NY 10012. 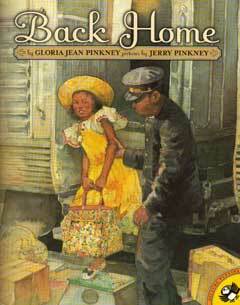 Back Home, written by Gloria Jean Pinkney and illustrated by Jerry Pinkney, is published by Puffin Books, an imprint of Penguin Putnam Books for Young Readers, 345 Hudson Street, New York, NY 10014.